To All Die Hard Boxing Fans ! With a resounding opening flurry, first-time Vermont writer Jonn E. JaGozza has delivered a knockout. He has just released The Boxing Dictionary, the most complete dictionary ever written solely devoted to the unique sport of boxing. With nearly 2000 entries, The Boxing Dictionary clearly defines the language of the ring that resonates throughout the media. Now, for the first time, even the most casual observer can gain knowledge and a thorough understanding of this exceptional sporting language by embracing its emotion and relentless action. In addition to word definitions, The Boxing Dictionary includes a glossary of phrases notable to the sport, and as a bonus, the author has added several pugilist poems that capture the intensity, rawness and grit of the boxing game. History reveals that as far back as 688 B.C., the ancient Greeks introduced boxing as an Olympic sport. Recently, ESPN ranked boxing as the world’s most difficult sport because of the strength, endurance and reflexes needed. 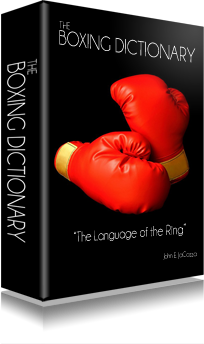 Jonn E. JaGozza’s lifelong passion and love for the sport of boxing is evident on every page of The Boxing Dictionary. He has devoted the past fifteen years to this text, and the result is a prize that belongs on the shelf of every boxing fan. At this time the author is offering this book for purchase exclusively through his website at www.boxingdictionary.com. The Boxing Dictionary …. the next best thing to being ringside.